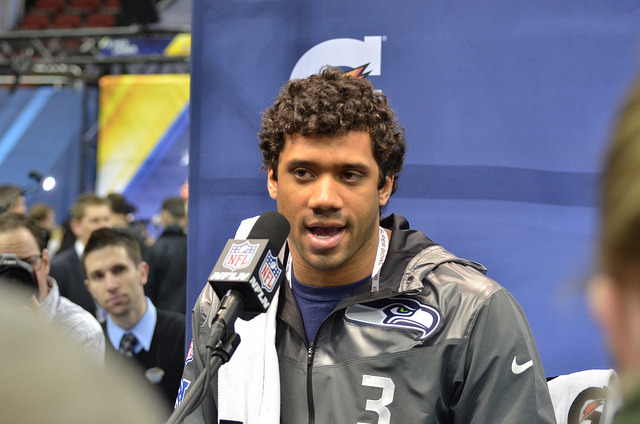 Athletes are rarely exceptional actors, with few possessing the expertise and gravitas to hawk a product convincingly. Still, there remain athletes who, with the right combination of personality and star power, manage to pull it off. Considering endorsements, likeability, and on-the-field success, we ranked the National Football League’s five most marketable players. 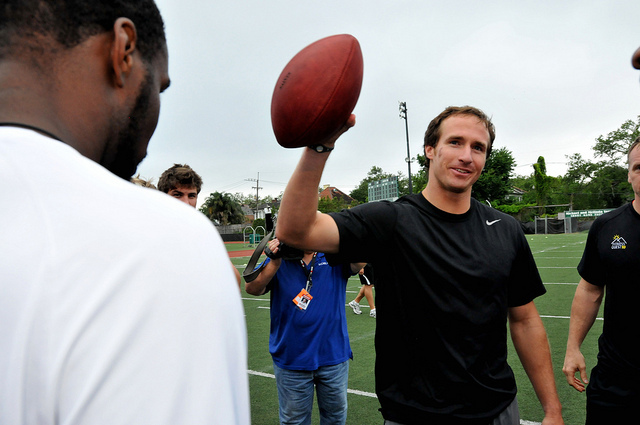 Since joining the Saints in 2006, Drew Brees has become one of the most successful — and highest-paid — NFL quarterbacks. Brees has accumulated six Pro Bowl selections and saw his stock continue to rise after he led New Orleans to its long-awaited Super Bowl ring in 2009. In 2012, the Austin native signed a five-year, $100 million contract extension, putting him at No. 5 on the list of the world’s highest-paid athletes. Brees is marketable, too, and his reputation as a family man can be seen shining through in partnerships that have included PepsiCo, Chase Bank, Wrangler, Nike, and Verizon Wireless. On a local scale, Brees is also a fixture in the New Orleans community and has largely become one of the city’s greatest advocates of rebuilding after Hurricane Katrina. His charity, Brees Dream Foundation, has contributed more than $17 million to charities and academics in New Orleans, San Diego, and West Lafayette/Purdue (Indiana) communities. Brees, the second-highest paid player in the NFL, makes approximately $11 million a year in endorsements. Since relocating to Denver in 2012 after fourteen seasons with the Colts, Manning has seen a variety of career and endorsement benefits. 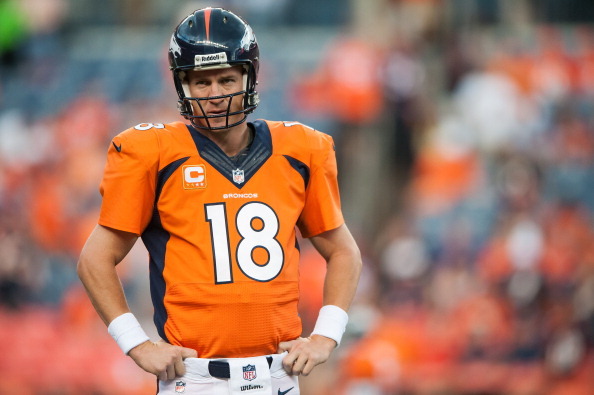 A five-time league MVP, Manning fell short of a Super Bowl title after losing to Seattle in this year’s game, but set passing records and will undoubtedly continue to be heralded as one of the game’s greats. With a $96 million, five-year contract that requires him to pass an annual physical in order to get paid, Manning is also the NFL’s top product endorser. Annually, the 6-foot-5 QB earns approximately $12 million off the field for ventures with DirecTV, Gatorade, and Papa John’s. Fun fact? Manning also seemingly puts his money where his mouth is, as he signed a deal in 2012 to own twenty-one Papa John’s stores in the Denver area, becoming a franchise owner. One of the league’s “veteran” players who has been in the NFL for more than a decade, Patriots QB Brady has staying power and longevity in regards to marketability: His recognition will continue long after his retirement. Despite being a two-time league MVP and leading the Patriots to three Super Bowls, Brady has had a different approach to endorsement after a few early efforts — like Movado and Smartwater — didn’t pan out. Currently, Brady is closely aligned with two brands: UGG and Under Armour. Brady is known as a serious and discerning partner, requiring face time with company executives and even owning equity and receiving royalties (as is speculated with his Under Armour contract). In terms of recognition, being one half of a power couple doesn’t hurt, either: His wife is supermodel Gisele Bündchen. Making $49 million annually, Rodgers is the highest-paid player in the NFL and one of the league’s best. 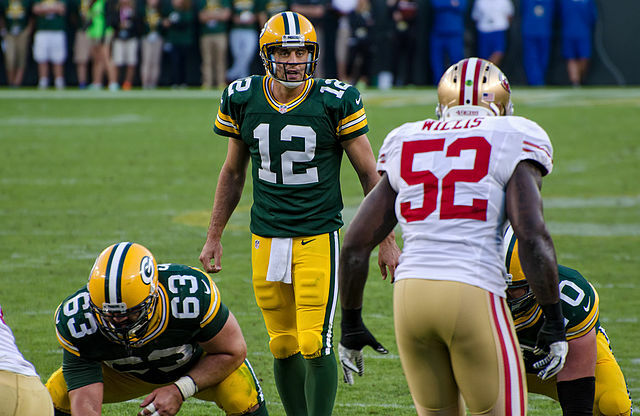 To top it off, Rodgers is also one of the highest-paid Nike athletes in terms of endorsement; he has racked up approximately $6 million annually off the field with ventures such as Pizza Hut and State Farm. The Packers QB is only 30, so time will tell if his likeability and marketability pay off in the long run. Thanks to a five-year, $110 million deal, though, it doesn’t seem as though Rodgers is going anywhere anytime soon. Wilson is listed here for a very simple fact: His star is rising, and fast. This past season — only his second in the NFL — saw the Seahawks QB lead his team to a Super Bowl victory. Among other key stats pointing to the Virginia native’s rise include the fact that Wilson’s jersey was the second-best seller in 2013 (after Manning’s) and that he has endorsement deals with Alaska Airlines, Nike, Levi’s, and EA Sports. With Seattle sporting one of the youngest rosters in the NFL, marketers see the opportunity to get behind the team’s dynamic, charismatic leader. Can you blame them?